Functional furniture is more popular than ever, and for good reason. Why should a room in your home have only one function when a simple, yet a clever piece of furniture can open up a multitude of possibilities. A Daybed with Trundle is the perfect example of a harmonious union between form and function. Even when space is limited, the pleasure of sharing holidays with friends and family is not optional. In this Ikea inspired generation, converting your living room into a comfortable bedroom for guests is easy as pie. A spare room can now comfortably sleep two, while taking up half the space, and don’t even get me started on storage possibilities. As a couch alone, you have the benefit of an over-sized sofa, so if watching tv with your legs stretched out appeals to you, then I think you’re ready for this jelly. Trundle beds, also know as truckle beds, are one of the best inventions ever, and we’re about to show you why! Stunning, space saving, multi-functional and a killer sleepover option for all ages. This Victorian styled day bed with trundle is our firm favorite for several reasons. Its classic, clean look makes it the perfect piece to decorate a room around. Down to the last detail, the designer of this piece of furniture has ensured you have a quality product at a price that’s hard to beat. With the trundle packed away, you have an inviting sofa, and when the family invades over the holidays, it’s ready to go to work. If you intend to leave the roll out bed made, you may want to use a bed skirt to keep the daybed looking neat. A 16 inch bed skirt with split corners will do the trick. The top seating/sleeping area can hold 400 pounds and the roll out below has a recommended maximum capacity of 225 pounds. Beautiful, practical, functional and great value for money. The trundle is not attached to the bed frame and can easily be rolled anywhere. Two of the wheels are lockable so the bed can be secured and won’t move around when in use. It also comes in 3 colors, white, bronze and pink. Who doesn’t love options when picking out a piece of furniture! 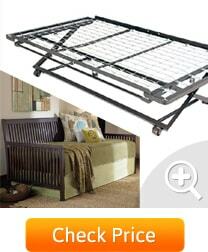 If you are looking for a larger size, the manufacturer also makes this bed in a full twin size. The roll-away supports 225 pounds of weight lying down. If an adult was to sit heavily on one of the slats, they could bend. This can easily be avoided by having a piece of hardboard cut to size, and placed between the slats and mattress. This will help distribute the pressure and ensure your trundle last a long time. The silver screws that secure the bed pieces together are visible, but do not detract from the overall look of the bed. If you wished, these could be touched up with a bit of paint to completely polish the overall appearance of the furniture. 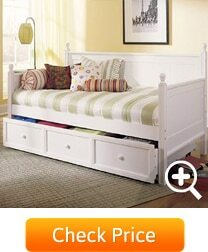 Base Support: 20 Slats on Daybed & 19 Slats on the Trundle. Box Spring not required. Another great looking centerpiece for any room, and if you’re looking for a larger seating and sleeping area, this solid wood daybed can accommodate an extra long twin mattress, and boasts the largest weight capacity in our selection, 600 pounds to be exact. If you use an extra long twin mattress on the top level, changing sheets will be tight work, but taller guests will definitely appreciate the extra stretching room. It has a neatly enclosed trundle draw with plywood panels instead of the usual slats which makes it equally effective as a storage drawer. For a kid’s room, shallow boxes would be ideal for packing toys or blankets, and the drawer handles and wheels make it super easy to access. It is quick to assemble and comes in both Off White and Honey Maple. Both wood finishes lend themselves to a warm, classic country feel. The clean lines complement modern decor. Add back support pillows for use in a lounge, or scatter with fluffy toys if used in a child’s bedroom. Looking for a more polished, upholstered look, then this classic gray day bed fits the bill. The trundle packs away so neatly, it looks just like a couch. If you have a modern condo, study or dorm room that needs a couch and the occasional bedroom conversion, this daybed is perfect. The trundle is also ideal if you prefer to use it for storage as it has a wooden edge so stored items stay neatly in place. It’s easy to assemble and we rate this as one of the most versatile looks that will blend into almost any setting. The back panel does not extend all the way down the back of the couch, so ensure your mattress is 8 inches so you don’t see the gap. We have included this sturdy wooden piece in our collection for its unique piano style look and versatility. It can be dressed up to look sleek and stylish, but is just at home in a child’s bedroom. Its solid, quality build can handle even the most rambunctious play. The trundle can be used to store an extra mattress for sleepovers or as a spacious toy box. The handles on the front of the draw make it easy for little ones to access their playthings, and hopefully pack them away too. It comes in two color finishes, Espresso and Cherry Oak and is easy to assemble. 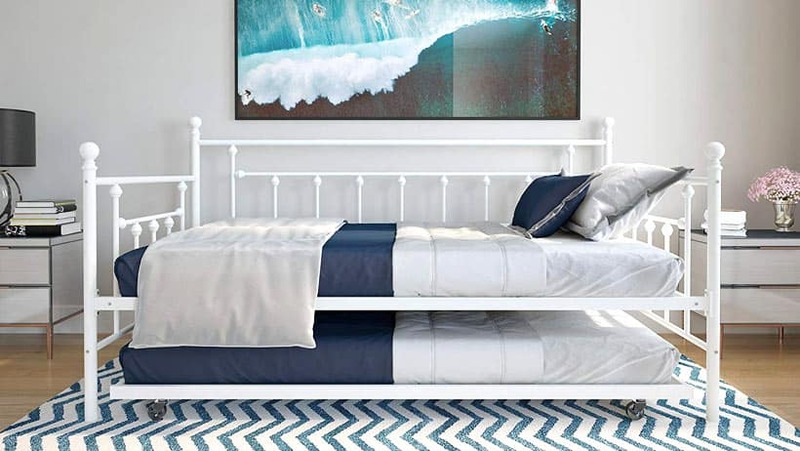 If you are planning a bedroom makeover, this daybed is a classic statement piece that will outlast your child’s younger years and follow them on through college. This Faux Leather Upholstered daybed with sleigh styled armrests, has a distinctly masculine look. It suits an office or study with its clean, no fuss lines. 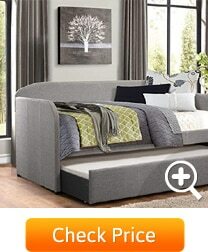 Like the gray option above, this daybed looks like a couch and neatly camouflages its bed functionality. The Espresso faux leather fabric is also easy to wipe down and clean so it’s a good match if you enjoy visits from the grand-kids, and the sticky fingers that come with them. This timeless piece is well built and easy to assemble. The back is not fully upholstered so it will need to be positioned up against a wall. The winning feature of a pop up trundle over the roll out version, is the height of the pop up can be adjusted and elevated to the same level as the daybed. With matching mattresses, the two parts can be lined up to create a luxurious king sized sleeping area for your guests. We recommend two 7 inch mattresses for the job, this way it fits away neatly on the pop up and the daybed is not too high, revealing more of the attractive wooden back panel. The base of both the daybed and the pop up have link springs for mattress support, but you have the option to order a wooden platform if you prefer. First on our list and the winner in the price category is the Victorian Metal daybed by DHP. This piece looks more expensive than it is which you’ve got to love. Although it does not have the weight capacity of our strongest weight contender, it can still take a 400 pound load. For everyday use in a family room or as a child’s bed, we recommend adding a board between the mattress and metal slats, to help spread the weight and add years to the structure. The white, solid wood option with the trundle drawer is our winner for strength. 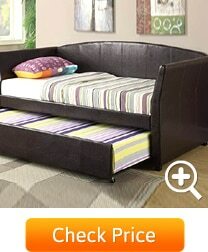 It can handle 3 people seated on the couch and a heavy adult will comfortably sleep on the extra length mattress. The rollaway should ideally be used for children or adults under 250 pounds, which is still substantial. If reinforced with a cheap 1/8 inch Masonite board from your hardware store, you could probably increase the load slightly. The espresso wooden daybed is our runner up. Although we have not had its weight capacity confirmed, it is very sturdy and well built, and should perform well under a little extra pressure. 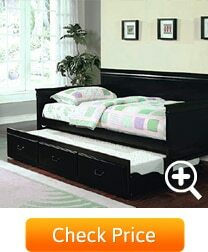 Instead of inserting a mattress, the trundle drawer can also be used as a storage drawer. The Casey II is a great choice if you plan to store things like linen, toys or even seasonal clothes! Space Saving – Yes, this point is obvious, but can’t be overstated. You get two beds with the footprint of one. This is the number one reason anyone would select this unique style of furniture. Extra Storage – The trundle area can be used for a mattress, or for extra storage of kids toys or seasonal clothing, etc. Effortless Set Up – Readily available and easy to set up an extra bed for guests. Multi-functional – A couch that’s a bed and secretly holds another bed. Mind blown! Spacious Sofa – As a couch, the seating area is much larger, giving it a roomy, luxurious feel. Perfect for Nap Time – Sunday afternoon power naps in a sunny spot, don’t get any better than this. 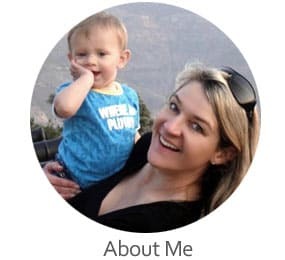 Personal Space – If kids and pets love to be close, but you need a little extra room, roll out their own bed right at your feet. Affordable Decor – They look fantastic and you get double the furniture for half the price. With the right accessories and styling, a daybed with a roll-away bed can be a stunning centerpiece for any room. If you like to keep the roll-away bed made-up, but find you need extra space for a duvet and pillow, add risers to the bed to give you that extra bit of moving room. If your trundle works with a roll out drawer, raising the bed/seating area marginally with risers, will avoid little fingers from being caught between the draw and the bed. By adding as little as an inch, you can avoid any accidents. If you want to hide an exposed truckle, a bed skirt or dust ruffle with split corners will neatly conceal it. For a more modern, clean look, a box frill is best. 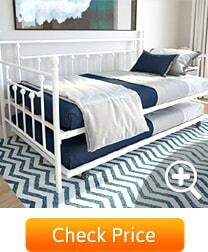 Most daybeds and trundles have slat support and do not require an additional box spring. Recommended weight capacities are determined by even weight distribution on the frame. To avoid damage to the frame or slats from excessive weight in one area (like kids jumping on the mattress), a 1/8 inch hardboard will increase the lifespan of your furniture. When buying a mattress, the top mattress should generally be the better quality of the two, as it will get more use and wear. The lower mattress is generally thinner to ensure it stows away properly below the main sleeping area.